VHS, Betamax, Laserdisc. Tube Televisions, 50's Jukeboxes, Transistor Radios. Speak & Spells, Toy Robots, and other junk we're not sure WHAT it is. 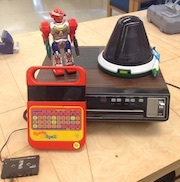 Old electronic "trash" is treasure here at the Maker Hub. We maintain a collection of assorted vintage electronics, to tear down for unique parts, for circuit-bending, or as inspiration for new projects. The collection is constantly changing. Drop by to see what's available, and stay tuned for workshops where we'll take old gear apart and come up with new uses for classic tech. Vintage electronics are generally available for free use in workshops and individual projects. Restrictions for use may apply to some items, on a case-by-case basis.